When shopping for vintage, it is very important to use a tape measure. Check our measurements against a garment that fits you well, not your own body. You may want to add room for movement. We suggest about one to two inches. If you have questions about how something fits, we're pretty good at making educated guesses about how a vintage dress compares to a modern size. However, those would be estimates. The only way to fit a garment accurately is to use measurements. Bust is measured straight across from armpit to armpit then doubled. 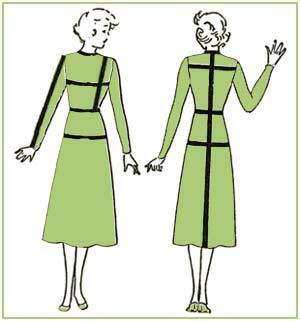 Waist is measured at the waist seam then doubled. If there is no waist seam, the waist is approximated at the natural waistline. Hips are measured 9 inches below waist and then doubled. Shoulder to Waist is measured from the top of the shoulder to the waist seam. Shoulders are measured from seam to seam in the back of the garment. In the case of a garment that has no shoulder seams, as in a dolman or raglan sleeve, we approximate shoulder measurement, based on where the natural shoulderline would fall. Sleeve is measured from shoulder seam to cuff or edge of sleeve. Length is measured straight down the middle from the center back to hem. Inseam is measured inside the leg to the hem. Outseam is measured outside the leg from the bottom of the waist band to the hem. Rise is measured from the center of the pants below the waist band to the point where inseams come together at the base of the crotch. Chest is measured from armpit to armpit. Length is measured inside the shoe from toe to heel. Width is measured on the bottom of the shoe/widest part of the sole. Heel height is measured from the heel cap to the base of the heel.